These antique horse brasses were made in England probably between 1880 through 1920. 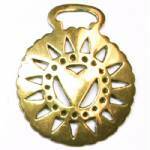 Some are stamped from sheet brass; others, such as the example shown, are cast in sand molds. Our brasses have been lightly polished by hand on the front, but are unpolished on the back to preserve evidence of honest use on a horse harness. Many antique brasses have rub marks and discoloration on the back, rub marks on the hanging loop, and perhaps some light scratches or marks on the front. Click "View larger images" to see the brasses available. Select the horse brass you want from the drop-down list below. If you have an alternate choice, please list that in the "Notes" section in case your first choice is not available. Sold per each. Subject to prior sale.